Padstow’s annual Christmas festival generates around £5 million for the local economy, according to recently released figures. The four day event, which is held during the first week of December, attracts tens of thousands of people to the harbourside town, and has become one of the largest and most successful of its kind in the country. It was conceived from a collective desire to make Padstow a year-round tourist destination and give a much-needed out-of-season boon to its towns, shops, and cafés. Malcolm Bell, chief executive of Visit Cornwall, estimated that the not-for-profit festival generates around £5 million for Padstow’s economy at what would otherwise be a quiet time of year. “The holy grail of Cornish tourism is for both day and, most importantly, staying visitors to come to our region in low season, and to contribute to our economy and support jobs through their spending,” he said. As well as cooking demonstrations by a Who’s Who of top chefs, including Rick Stein, Nathan Outlaw, and Paul Ainsworth, the festival plays host to more than 100 food, drink and craft producers from across Devon and Cornwall. Several local businesses report bumper takings during the festival, often outstripping what they earn during the height of the summer season. “We launched our business at the 2016 Christmas festival, and the visitor profile was exactly the audience we were looking to reach,” said Daniel Laughton, who owns the Padstow Coffee Company. “We took on shop premises last April and more than doubled our turnover that weekend compared to our launch event. We had our most successful weekend of the year. Restaurateur Henk de Villiers Ferreira, who runs Trevisker’s Kitchen and Dining on the outskirts of the town, believes the festival is an essential out-of-season event. “Padstow Christmas Festival is massive for us. It gives us the bump we need to get through the winter,” he said. The festival, which celebrates its 11th birthday this year, attracted local, regional, and national media coverage last year. “The event itself generates a lot of media attention for the town and businesses, and it really helps pull people to the area when it has backing from the likes of Rick Stein, Paul Ainsworth, and other celebrities,” said Laura Perry, from Ann’s Cottage, which has two shops in the town. Barefoot Media, the Cornwall-based company responsible for promoting the event, has netted a total of five media industry awards for its work with the festival. 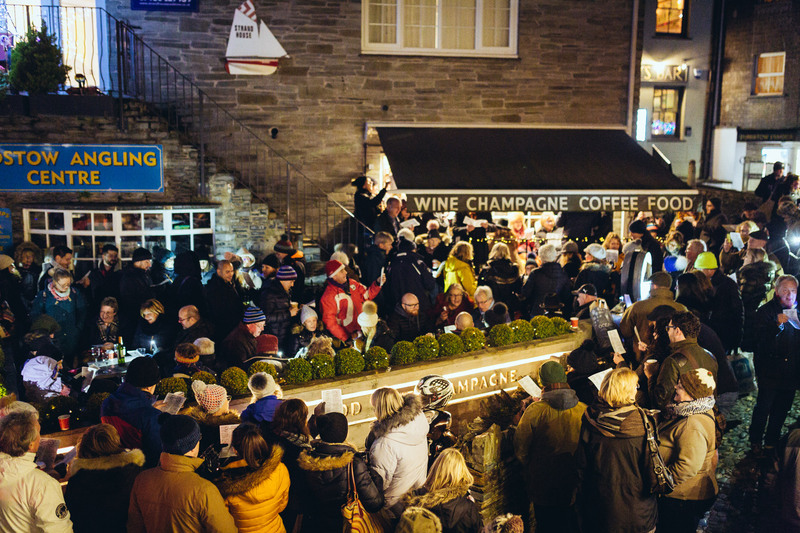 This year’s Padstow Christmas Festival runs from December 6th to 9th.